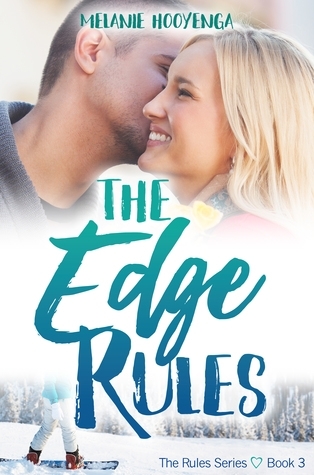 Featured Review: The Edge Rules by Melanie Hooyenga! Being a bully isn’t all it’s cracked up to be. Sixteen-year old Brianna had everything she wanted: money to ski all over the world, underlings to do her bidding, and parents who gave her every freedom—as long as she played by their rules. But when she’s busted shoplifting and assigned to the Chain Gang, she ditches her shallow ways and realizes being herself is easier than manipulating people. Forced to partner with kids she’d never dream of befriending, including Xavier, a boy who makes her pulse go into hyperdrive, Brianna vows to be a better person. Breaking Old Brianna’s habits isn’t easy, but her infatuation with Xavier—someone her parents would never approve of—motivates her to keep trying. Even when he convinces her to trade her swanky skis for a beat-up snowboard. Brianna lets go of her need to control everything and finally starts to feel free—until her past threatens to jeopardize her first real chance at love. She discovers balancing on the edge is as challenging in life as it is in snowboarding, and when a new friend is in trouble, Brianna must decide between the superficial things that used to be her world and putting her friend’s safety before herself. Another adorable read by Melanie Hooyenga. Bri has always been queen B... until now. Kicked out of the group she'd started and shunned by everyone at school, she finds herself in trouble. But maybe the trouble came at just the right time. Xavier was only protecting his sister, but he ends up picking up trash along the road anyway. He wasn't expecting to meet someone, let alone a girl whose connection to his friends was less than endearing. Will he be able to forgive her for who she was before? Possibly. Will she be able to forgive herself? That's a harder question. Everything. There's something so sweet and honest about the way Melanie Hooyenga writes these characters. They aren't perfect. In fact, their flaws are pretty huge, but they work through their issues and start to put themselves back together. It has a message that forgiveness is possible if you acknowledge the need to be forgiven. If you regret the things you've done. And that forgiving ourselves is much harder than anything external. There really isn't anything not to like about this one. A great books for all romance lovers with a message of hope that all young people can benefit from.